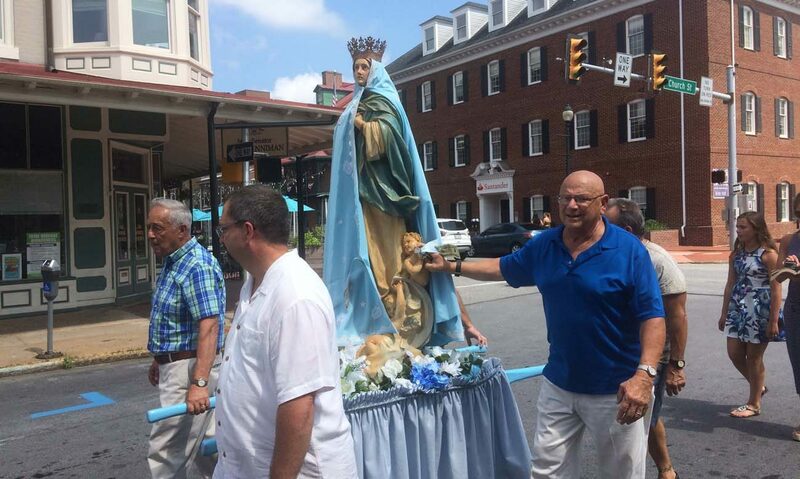 Members of the Assumption Day Parade Committee guide a statue of Mary for all to see at the 99th annual event held Aug. 12 in West Chester. Parishioners of St. Agnes in West Chester and the surrounding community chose Sunday, Aug. 12 to honor the Blessed Virgin Mary and her assumption into heaven at the 99th annual celebration of the solemnity, observed in the church on Aug. 15. The day began with morning Mass at St. Agnes Church, a communion breakfast at West Chester Country Club, then a public street procession and concluding benediction back at the church. The annual event takes several months of planning to pull off smoothly. Last April a group of 14 committee members came together to start organizing the day. Their tasks included obtaining permits to use the West Chester streets for the procession and bringing together supporting members of our Lady’s Court as well as a statue of the Blessed Virgin. The family of Sam Mobile, one of the original organizers of the celebration, has continued to participate three and four generations later. As every year, the Court includes a Queen of the Procession, and this year Mobile’s great-granddaughter, Alena Boyer of Wilmington, Del., held this special honor. Boyer’s older sister, Madison, was queen two years ago and her cousin, Maria Mobile of Coatesville who served this year as one of the eight attendants, hopes to someday have that privilege. It is also traditional for the Riccardo family to come out for the Assumption celebration. John and Nancy Riccardo are among the committee members and six of the attendants were their granddaughters. Approximately 130 faithful people came out for this year’s event. It is not limited to parishioners of St. Agnes or to Catholics, as everyone is welcome. Beyond the opportunity to see friends and bring people together who might otherwise miss one another in the midst of summer vacations, some participants come just to pray to the Blessed Mother, knowing they can turn to her in time of need. The Marian procession began at 2:30 p.m. outside St. Agnes Church on West Gay Street in West Chester with a statue of the Blessed Mother smiling down on all. It proceeded through the borough for a 30-minute walk before returning to the church. In addition to the Court, several committee members pushed the statue on a cart. A few people led the group in songs to Mary. Members of the clergy including Father William Donovan, pastor of St. Agnes, were present along with others who simply walked the parade route. “I’ve been involved for a long time and I’m still involved,” said Mary Lou Enoches, treasurer of the committee. With 99 years officially in the book, the committee hopes to begin planning soon for the centennial Assumption Day Parade. “We want to try and do something nice,” said Mauro. I will remember that for next year. Ironically, I was not aware of this West Chester celebration until last year’s had already happened but I remembered for this year and will do the same with your event. I can’t promise coverage until much closer to then but I’ll remember. Sorry you missed one of the largest celebrations that took place this past Sunday in Norristown — under the leadership of Msgr John Marine ( a native son of Holy Saviour Parish ) and Msgr Charles Sangermano, pastor of the largest Italian personal parish in the diocese — maybe next week or next year you can cover the Mass/ Street Procession/ and social following which draws hundreds of faithful to the area.